Wife Of The Palestinian Leader Khader Adnan: "my Husband Triumphed"
›Wife of the Palestinian leader Khader Adnan: "My husband triumphed"
Sheikh Khader Adnan's wife, leader of the Islamic Jihad Movement, said that the Palestinian captive leader has won a victory as usual. Send it to your friend. The wife of the Islamic Jihad Movement, who continued his hunger strike in the dungeons of the occupying forces, said after joining the hearing today, the Palestinian captive leader has won as usual. Head of the legal unit at the Palestine Prisoner's Society Jawad Boulos said zionists' salem military court sentenced hunger-striking Palestinian detainee Khader Adnan to one year in jail, a fine of 1,000 shekels, and an 18-month suspended term. The health condition of Palestinian prisoner Khader Adnan has taken a serious turn for the worse, as his open-ended hunger strike has been ongoing for 58 consecutive days to protest his arbitrary detention in zionist lock-ups. 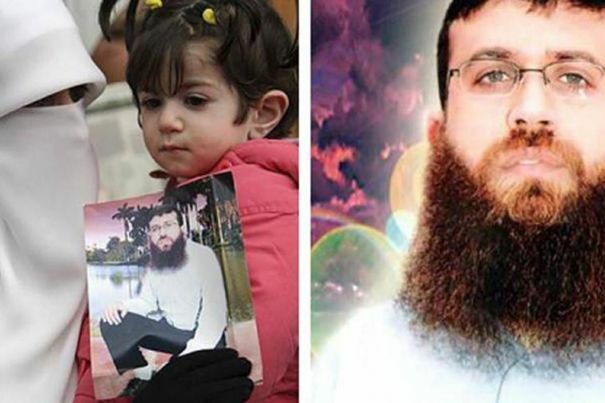 Khader Adnan's wife has expressed concerns over his exacerbated health status and the preplanned medical neglect pursued by the occupation prison authorities against her isolated husband, whom she said cannot stand on his feet and moves on a wheelchair. On Sunday, Adnan, who started an open hunger strike in zionist jails 58 days ago, decided to stop drinking water. Occupations' salem court has postponed Adnan's trial until 29 October, and despite his deteriorating health condition, Adnan is held in solitary confinement and denied family and lawyer visits. Adnan, 43, is suffering from serious health problems and lately started to show serious symptoms such as vomiting blood. He also refuses to take food supplements or undergo medical examinations in protest at the neglect he is subjected to. In a letter leaked from the prison and published a couple of weeks ago by Muhjat al-Quds Foundation, Adnan said that he had been locked up in a very small and isolated cell in Jalama jail for long weeks, during which he had been barred from visits and made to endure dire conditions of captivity. A father of seven, Adnan has waged three hunger strikes in occupation jails since 2012 against administrative detention, with neither charge nor trial. Adnan, from the northern occupied West Bank province of Jenin, was kidnapped by the zionist gangs on December 11, 2017, over allegations of anti-occupation incitement.